My son and I spent the 4th of July week river rafting the Wild and Scenic Rogue River ofOregon with OARS. Rafting, an outdoor adventure tour operation specializing in family river adventure trips. We spent five days and four nights navigating the beautiful river, basking in the sun of Southern Oregon, finding swimming holes and jumping rocks, camping under the stars, and eating gourmet meals. Not once did we need to know what time it was (in fact, we were told to relax…we were on ‘river time’) or where to go next. We left the cooking, packing, rowing, and even the entertaining of kids up to our expert guides. During our five days on the Rogue, we saw multiple private parties taking the same route. 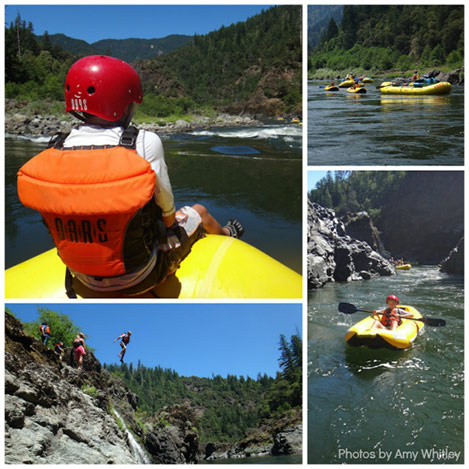 In fact, independent groups can raft the Rogue River for the cost of a boat rental, food, and rafting permit. With OARS, the cost for a five-day trip can top $1000 per adult. Is it worth the premium price tag? After five days with OARS, I’m convinced the short answer is yes. (for the very short explanation, watch my youtube video below.) If you can afford it (or save for it), a vacation such as our experience with OARS (whether on the Rogue or any number of rivers across North America or worldwide) is worth the splurge. On paper, families receive the following for the cost of their trip: three gourmet meals per day, experienced guides (our ratio was nearly two guides to every three people), all equipment (from rafts and kayak ‘duckies’ to PFDs and helmets), drinks (including beer and wine), and tents. In reality, however, we actually received much more for the cost. Why? OARS guides know their stuff. The Rogue is not a technically difficult river, but there are class IV and V rapids to navigate safely, and things do go wrong. We saw several rafts wrapped around rocks during our trip, and when one of our own became wedged between a rock and a hard place (literally) and was unable to budge against a heavy flow of water, our three-women and one-man crew sprung to action, using a technical pulley system to create an effective mechanical advantage. Had we been rafting solo, our boat would be against those rocks to this day. Even when all went according to plan, our OARS team directed us to the best swimming holes, hikes, and jumping rocks along our route, and navigated us to the best campsites at night. They were a wealth of information on the river–from history to geology–and proved flawless judges of safety on the river. Before lunch time of Day 1, our guides understood our respective comfort levels and ability levels (and that of the kids) and acted accordingly. During our five day trip, I felt safe 100% of the time. It didn’t hurt that I never needed to so much as glance at a map. I often remind travelers who are looking for economic savings that time is money. On our OARS trip, 100% of our time was ours to spend as we like: with our family, our kids and new friends, and in the outdoors. Because camp set-up and food preparation was left to our guides, no tension existed. Imagine a five day vacation without a cross word, moment of stress, or decision to make. Try to picture it: three meals a day plus snacks and desserts, and zero prep, cooking, or clean-up. Instead, while on an OARS trip, families simply wait for the appetizers to be served. Yes, appetizers. Every evening. While we had ample free time with the kids attending the trip, our guides proved to be camp counselors as well, playing field games like kickball and bocce ball with the kids, entertaining them with riddles and jokes, and somehow being the most fun people ever while still enforcing all safety rules. OARS guides do not replace parental supervision, by any means, but will reinforce parental decisions and make parents’ lives much easier on vacation. The value of an OARS trip is in the guides. During our five days on the river, I experienced their leadership, playfulness, competence, and darn good cooking. These women and men were the hardest workers I have seen in the travel industry, starting with the 7 am coffee call to the guitar playing and riddle telling well after dark. (In between, they are rowing heavy gear boats, cooking, setting up camps, playing with kids, and swimming.) Because our guides worked so hard, we could play hard…together. The kids on the trip became friends, and the adults bonded over the experience. Day after day, we played on the river, sliding down natural water slides, finding swimming holes, fishing, laughing, and hiking, all with no thought as to what was for dinner or where to set up the tents. While it’s impossible to put a price tag on family unity, fun, and peace of mind, many similarly priced vacations do not include the above. If trying to decide whether an outdoor adventure such as an OARS. rafting trip is a better value than going it alone or with a less expensive operator, the answer is yes.